Dupaco helps members in a short-term pinch, and coaches them to the goal of financial independence. That's because we're a not-for-profit cooperative, where people are worth more than money. 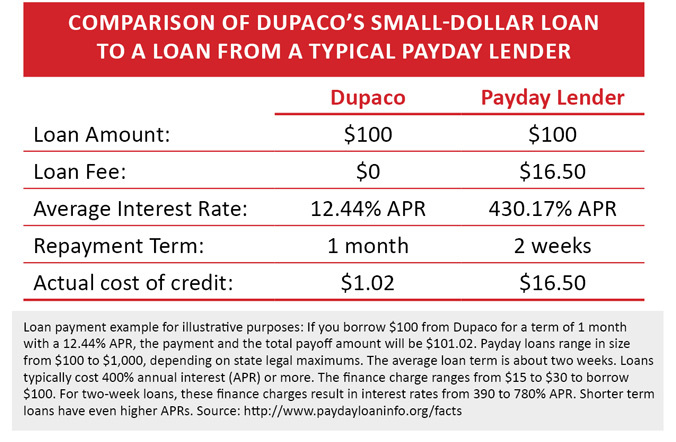 More than one out of three loans made by Dupaco is a small-dollar loan of $2,500 or less. In 2016, Dupaco made 9,123 loans that were $2,500 or less. Payday lenders may argue that the APR is misleading because loans are often paid back within two weeks. But, if the borrower is unable to repay the loan in full, the cost of the loan escalates. At this point the loan is "rolled over" into a new loan. If this continues, the original payday loan becomes expensive and starts a cycle of debt. By setting up loans with easier repayment terms, Dupaco can help individuals stop the borrowing cycle. Are you interested in opening a loan with Dupaco? Apply online in minutes, or contact the consumer loan department by emailing loans@dupaco.com or by calling 800-373-7600 / 563-557-7600, extension 202.